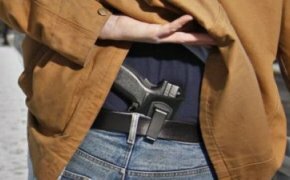 The goal: you have any of several reasons to be licensed to carry a personal firearm. The problem: you have never shot a handgun. Verify your eligibility for a handgun license. Take our "Learn to Shoot" class. These are held twice a month at a private range. Classes are generally 1-7 people. You can pay a fee into the ammo pool and shoot 3-4 guns of different sizes and calibers, or bring your own gun and ammo. These classes are usually scheduled about a week before an LTC class. Sign up for an LTC class. "Learn to Shoot" students get a large discount. While I do hold a strict training standard, no one under my instruction has ever failed to get the license. That's over 1900 people. Either right before or right after the class, start your application at DPS and schedule finger printing at the same time. We have a special course that combines an hour of intensive range training with the LTC Proficiency. Take that, then attend a regular LTC class sometime later, but with the range qualification already done. This "Range Training" is offered a few times each month, for either $50.00 or $60.00 (depending on the day). You would then qualify for a discount on the LTC class ($50.00 for previous students), so the entire process would be as little as $100.00 with remedial training. Take our Combo crash-course. That is an all-day class, and will take you from absolute beginner with a handgun to completing qualification for the LTC, all in one day. Watch a Handgun Safety video online (free). Take the short online test. There is no range training required. Pay for and print out your Certificate of Training, and download the other forms provided. Mail everything to the VA State Police.